In the U.S. commonwealth of Pennsylvania, a borough (sometimes spelled boro) is a self-governing municipal entity, best thought of as a town, usually smaller than a city, but with a similar population density in its residential areas. Sometimes thought of as "junior cities", boroughs generally have fewer powers and responsibilities than full-fledged cities. Boroughs also tend to have more developed business districts and concentrations of public and commercial office buildings, including court houses. Both are larger, less spacious, more developed than the relatively rural townships, which often have the greater territory and even surround boroughs of a related or even the same name. There are 958 boroughs and 56 cities in Pennsylvania, but only one town, the town of Bloomsburg. All municipalities in Pennsylvania are classified as either cities, boroughs, or townships. The only exception is the town of Bloomsburg, which is recognized by state government as the only incorporated town in Pennsylvania and uses the distinction in its promotion. 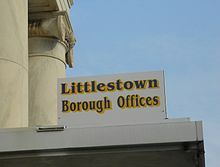 Many home rule municipalities remain classified as boroughs or townships for certain purposes even if the state's Borough and Township Codes no longer apply to them. ^ a b The Pennsylvania Manual, pp. 6–61. ^ a b The Pennsylvania Manual, pp. 6–3.